Host Larry Mantle has a segment that includes Metro CEO Art Leahy and Ethan Elkind, the UC professor whose new book is “Railtown: The Fight for the Los Angeles Metro Rail and the Future of the City.” Good conversation includes the topic of how rail corridors are selected in our region. Larry’s first question for Art: is rail worth the expense? Listen for the answer! Listeners also get to throw some questions at the guests — including the “is it safe to ride” question. Another listener gives taptogo.net a Darth Vader-type hug (read: the kind of hug you don’t want). Reporter Laura Nelson gets to the bottom of the original, colorful and now-replaced cover page of the High Desert Corridor’s draft environmental document. She also reveals Brad the Tortoise’s true identity and scores this gem of a quote: “I feel like I know the tortoise intimately.” You don’t hear that everyday in transportation journalism. The Texas Department of Transportation says that between 2009 and 2013, the state’s traffic fatalities rose by eight percent, even as those in most other states continued to fall. And deaths linked to commercial vehicle crashes, like trucks, soared by more than 50 percent over the same period. The boom has triggered a huge demand for both tractor-trailers and drivers. The Texas Trucking Association, an industry trade group, says the rising death toll has more to do with drivers sharing the road with trucks than with the truckers themselves. Smart series of article that expounds on a public safety issue that is probably not obvious to many people. This is probably a Pulitzer candidate. In a story that perhaps is better suited to April 1 or the Stone Ages, the Post interviews a “railway Romeo” who claims to have dated 500 or so women he has met on the New York Subway in the past 15 years. He says he’s written a book about it, thus triggering the Post’s interest. The article’s kicker is my favorite part in which we get this stale/creep advice: once a phone number is secured, never call for at least 60 hours. Reminds me of “Swingers.” Perhaps Gawker’s take on the Post article is more accurate (warning: adult language). I include the article here as a teachable moment. Look, we’re all for people being friendly when they take mass transit and, yes, we even held a speed dating event on Valentine’s Day when willing riders could meet other willing riders. Outside of such events, we encourage riders to respect other riders’ privacy and private space and remember ‘no’ means ‘no’ — not ‘mabye’ or ‘I’m thinking about it.’ Bottom line: please do not stare, leer or pester folks who want to be left alone. 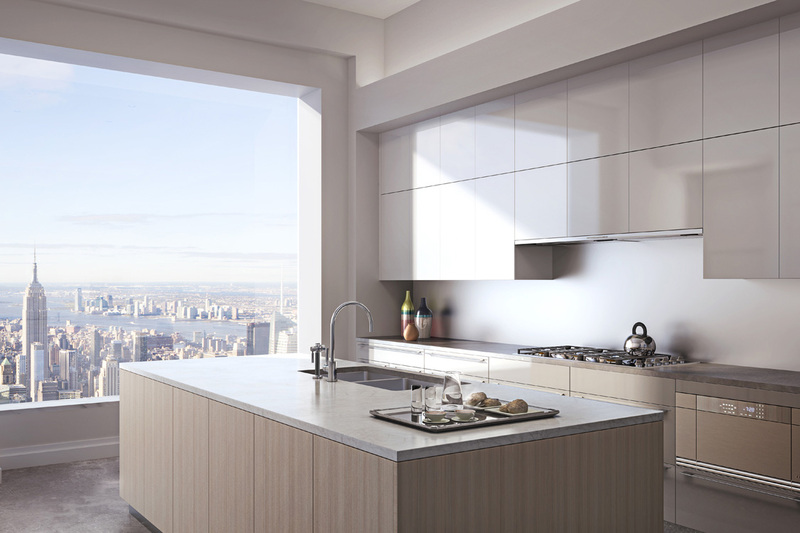 A pretty ordinary looking kitchen at 432 Park Avenue if you ask me. Photo: 432 Park Avenue website. Talk about densifying….construction is underway on a 1,396-foot skyscraper that will be the tallest skyscraper in New York (excluding the spire of the One World Trade Center). Here’s what is amazing: it’s a condo building, not an office building and there will be 104 residential units spread out on its 96 floors with the penthouse listed at $95 million and the cheapest unit costing $7 million. If there are any of the ‘have nots’ left in Manhattan, please raise your hand! The “rail is dangerous” propaganda line has proven to be sadly insidious in the minds of Angelenos, even at this late date. It seems to me that with the facts on the side of rail infrastructure’s safety, this is an area ripe for a Metro ad campaign. As with climate change and vaccinations, misinformation makes the public think that the jury is out. When you say “has” does this mean this segment is an ongoing recurrent segment on KPCC? I’d actually would favor this idea of having a recurrent 1 hour show on public radio every week by Metro CEO Art Leahy. As the head of Metro, it would be nice way for the taxpaying public to listen and talk to the Metro CEO directly to voice out their concerns and issues. Glad you enjoy hearing Art talk and I’ll pass that along when back in L.A. If you see him on the Gold Line or on transit, please feel free to say hello. He’s a nice guy and exceedingly unpretentious and plainspoken dude (then again he was a bus operator) for someone leading a 9,000+ employee agency with a four billion dollar plus budget. Art and his wife are very nice and knowledgeable people. Both started out as bus operators with the RTD and rose thru the ranks to upper management only to be terminated by those in control during the early days of the MTA. When it was recognized that the MTA needed someone who actually knew about transit Art was rehired as CEO.